In a year when I've gave up a good part of my riding modus operandi, I'm thinking of bringing something back. When Daylight Savings Time ends is when I typically hang up my commuting gear and park my street bike. While I used to ride year round for the first two years of my riding life, I simply decided to mitigate risks and take a break during the time of year when night falls earlier and burns off later. Coupled with the damp to wet conditions of fall and winter (normally), it was just akin to stacking the odds against myself to continue to ride during these conditions. So since then, I haven't. But lately, I've been thinking of riding through the time of the year when I haven't been. 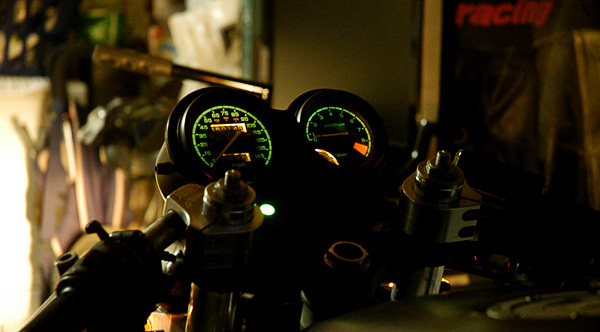 The gauge cluster light bulbs on my Hawk GT have been blown out since I bought this bike. I've replaced them now if I'm to keep riding in the dark. Maybe it's because effectively giving up weekend riding meant even more less seat time than I've been accustomed to, so perhaps I'm trying compensate now. Or maybe it's because I care less about my '88 Hawk GT than I did for my '02 R1 if the worst were to happen during my commute (btw – you know you're a rider when you care about your bike more than your own welfare!). Or maybe I'm realizing that I was actually just being too cautious by not riding at night. Maybe all of the above? It can't be about the ten or fifteen minutes I save during my work commute, which is the difference in average between commuting on my bike and my car (in the car, I take roads less travelled; more distance, but less traffic). I don't know, but I feel like I'm ready to bring back something that I've taken away for awhile now. Maybe I've just been avoiding riding at night for so many years now, I'm actually missing it, as if it's a new experience all over again. Whatever my reason(s) may be, I'm going to be giving riding in the dark daily another shot. However, if/when the California rain falls, all bets are off; the bike get parked. I'm still mitigating some risks even when I'm loosening up.